We invite you to improve your work ethic, self knowledge and discipline. Our facility offers an intelligent and proven process to help individuals discover their physicality, cultivate skills and develop awareness of how to LIVE , MOVE and also be STILL in their body. We are a growing community dedicated to exploring the full universe of movement under the guidance of our sensei. We don’t do fitness and exercise, we approach the spectrum of movement as craftsmen and perpetual students, cultivating a daily practice with a beginner’s mind and doing the work that needs to be done with self ownership. We teach principles rather than skills. Our students learn how to become aware of their patterns, move their spine, locomote across the floor, invert, work with objects, be co-ordinated, have speed, strength, mobility and morph into GENERALIST MOVERS rather than specialists. 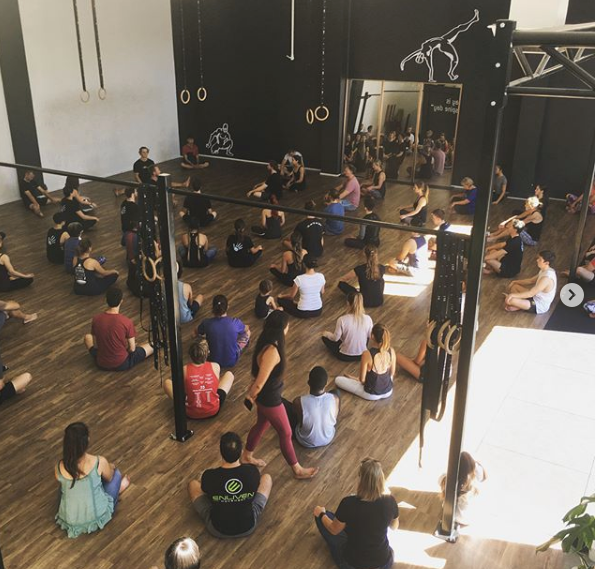 We teach our students using various tools, methods and concepts from the wide field of physical movement learned from years studying closely with Ido Portal. For this reason, we teach ALL LEVELS from the absolute beginner onwards. There is a schedule of daily classes and open gym to help further the development of your movement possibilities, drawing on principles distilled from martial arts, dance, strength and conditioning, parkour amongst many more.